You don’t have to leave photos on your phone, where they could be lost. Protect them by saving them to the cloud and printing them. Your smartphone can store thousands of images, but if you’re not backing them up to an external source, you’re at risk of losing them. An external drive is a piece of equipment that hooks up to your computer via USB. It allows you to store large quantities of images without sucking up valuable space on your computer or phone. “For the average consumer, if you can get your photos off of your phone and onto a hard drive, that’s a good thing,” Hagan says. Every photographer and expert I spoke with cited the importance of an external drive, which can hold “hundreds of thousands of iPhone photos” per terabyte, Hagan estimates. On Amazon, such drives range from less than $50 for one terabyte to $150 for eight terabytes. It’s a great way to preserve photographs long term, but relying solely on a hard drive isn’t smart, As Indira Williams Babic, director of photography and visual resources at the Newseum in Washington, D.C., notes, “hard drives [can] fail.” You’re better off storing your photos, as Hagan says, on at least two mediums: on a tangible hard drive, and in the cloud. ■ ICloud: For iPhone users, Apple’s baked-in cloud storage, iCloud, might seem like the most convenient option, but it comes at a price. Users of iPhones automatically get 5GB of free storage, which is about 1,500 to 2,500 photos, depending on the images’ resolution. You can buy bigger storage plans: 50 GB for $0.99 per month, 200 GB for $2.99 per month, or 2 terabytes for $9.99 per month. Pro: It comes integrated with your iPhone’s iOS operating system, so it’s easy to use with Apple products and share photos with iPhone users. Con: It’s expensive, and while you can create shared albums with iPhone users, it’s more cumbersome to share with non-iPhone users. ■ Amazon Photos: If you have an Amazon Prime membership, at $119 yearly, you have access to Amazon Photos, which offers unlimited full-resolution online photo storage and 5 GB of free video storage. Sanchez says this kind of “free benefit . . . is almost unheard of,” and he swears by the service for long-term cloud storage. You can share your unlimited storage with up to five people, share photos with these users in the “Family Vault” or with non-Prime members via “Groups.” You can also order custom art and prints directly through Amazon and stream videos and images onto your TV (if you have a Roku device). Pros: With unlimited free high-resolution photo storage with membership, easily shareable and accessible across devices, it’s great for anyone who uses Amazon services and devices. Cons: Video storage is limited to 5 GB, though you can buy 100 GB for $11.99 per year or 1 terabyte for $59.99 per year. 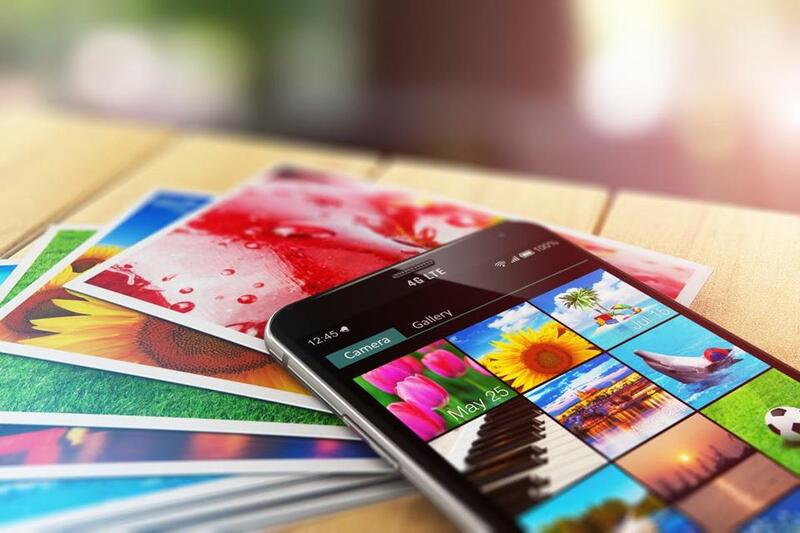 There’s a catch, albeit a small one: You may have to lower your photos’ resolution to cash in on the unlimited free storage. These images of “high” quality are compressed to a maximum size of 16 megapixels each (or printable up to 16 by 24 inches). Luckily, most smartphone photos don’t currently exceed that resolution, so you won’t lose much image clarity, if any. Backing up photos in their original formats over 16 megapixels will chip away at your 15 GB of free Google Photos storage. If you need to preserve higher-resolution photos, you can purchase 100 GB of Google Drive for $1.99 per month or $19.99 per year, or 200 GB for $2.99 per month or $29.99 per year. Pros: There’s unlimited free storage and sharing, and the system works well with any device or brand of smartphone, with unparalleled image organization. Cons: The “free” option compresses photos to a maximum of 16 megapixels and videos to 1,080 pixels. For original resolution, you may have to buy additional space for $20 to $30 per year. Babic knows a little something about keeping photos safe: She’s in charge of managing and storing still photographs at the Newseum, including every image that has won a Pulitzer Prize. ■ Don’t archive photos only via social media. You may think that if you post images to Instagram or share your photos on Facebook that they’re safely stored in cyberspace. These platforms make photos easy to access, but they’re not permanent solutions, and they don’t preserve the integrity of the images. “I don’t trust Facebook or Instagram to keep track of all my stuff,” says Sanchez, who explains that social media platforms markedly decrease the resolution of a photo. Plus, the sites “don’t back up metadata, the baked-in information” of the photo that may help you identify, sort, and share them. ■ Don’t let photos pile up on your phone. After you’ve securely backed up your photos, you can (and should) delete them from your phone. Sanchez’s process is a great one: Each new year, he backs up his photos to his external hard drive and the cloud. Then he deletes everything from his camera roll. Everything. Hagan agrees: “I delete huge swaths of photos because I know I can access them in my Google account [from] anywhere in the world.” Memory lane is never far away. ■ Don’t delay the process. Archiving thousands of photos can seem like a daunting task, but the hardest part is getting started. From then on, you can schedule automatic backups on your cloud-based service to give you peace of mind and enable you to easily organize and share photos with loved ones.